Master Domestic Brewery. For the 6th year now, the Magistr Domestic Brewery has been brewing honest homemade beer handmade from the finest ingredients. We are proud of our traditional lagers, but we’re not afraid of other different specials. Our production blends traditional recipes with modern technologies. Our beers are unpasteurized and unfiltered. And a good beer deserves good food, so we take our inspiration from traditional Czech cuisine. Our taps traditionally draft lighter 10° beers such as the Kateřina Ječná as well as fuller lagers such as our premium 12° Magistr Scott. Our popular beers also include the Císařský Weizen. We like experimenting with IPA, APA, and Bock style beers. In addition to beer, we offer our unique example wort lemonade. Our beer is primarily available at our restaurant. We also supply our partners with beer, and our keg equipment lets us prepare a keg for your garden party. Upon agreement, we can provide professional tour of the brewery. Guided tours can be combined with a tasting of our portfolio of beers with a commentary by the brewer. 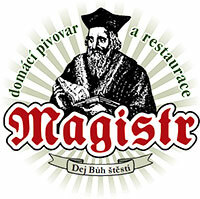 Beer from the Magistr Domestic Brewery can be found at a number of events dedicated to traditional handmade beer.